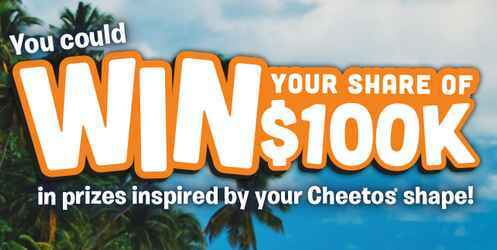 Frito Lay brings you the Cheetos Win What You See Sweepstakes at cheetoswinwhatyousee.com where they will be awarding $100k in prizes plus a trip for 4 people. Trip Includes: Air transportation, Hotel accommodations and spending money. How To Play: During the entry period buy any CHEETOS brand product and look for a uniquely-shaped CHEETOS snack. Take a photo of the uniquely shaped CHEETOS snack and visit this link: www.cheetoswinwhatyousee.com and follow the online instructions to register by entering all information requested on the registration form and then submit your Photo and title of your CHEETOS snack. Prizes: One grand prize winner will win a trip for 4 people; $100k in prizes, Instant-Win Prizes hundred fifty (250) / Set of playing cards. / ARV: $12.00 each.Two hundred fifty (250) / Luggage tag. / ARV: $11.00 each. Five hundred (500) / Magnet. / ARV: $4.00 each.One thousand (1,000) / Printable commemorative pedestal, awarded via Web Site. / ARV: $ .05 each. When To Enter: The Cheetos Win What You See entry begins at 12:00:00 p.m. (noon) Central Time (“CT”) on June 25, 2018 and ends at 11:59:59 p.m. CT on September 2, 2018. Who’s Sponsor: The Win What You See promotion is sponsored by Frito-Lay, Inc., 7701 Legacy Drive, Plano, TX 75024-4099.